Most patients with heart diseases have blood pressure monitors, which they use every day at home to assess their health condition. The monitors track the overall trend of a patient's health effectively, but they could prove useless when accidents happen. In the case of sudden cardiac arrest, a person's survival rate drops rapidly. But, the patient would have a 92-percent chance of survival if he or she receives first-aid treatment within one minute. The possibility of surviving would drop to zero if nothing is done within 13 minutes. So every minute, or even every second, is essential for saving a life. To avoid the worst-case scenario, monitoring a patient's real-time status and giving out an advance warning of impending risks are important. That will give the patient ample time to take the necessary measures. However, real-time monitoring by most blood pressure monitors available in the market seems impossible. Due to their size, it's unrealistic for patients to wear them all the time, especially when they are out at work or on holiday. Risk detecting and warning features are also absent. Tim H.W. Lui has developed Heartisans Watch - a wearable smart watch that enables users to measure their blood pressure anytime and anywhere, and cares for their health. By pressing a finger on the watch's screen for 30 seconds, instant information on a user's blood pressure can be obtained. The data will automatically be transmitted and stored in its linked app. The operating system will then analyze the data, send out reports and give suggestions to users on how to improve their health. 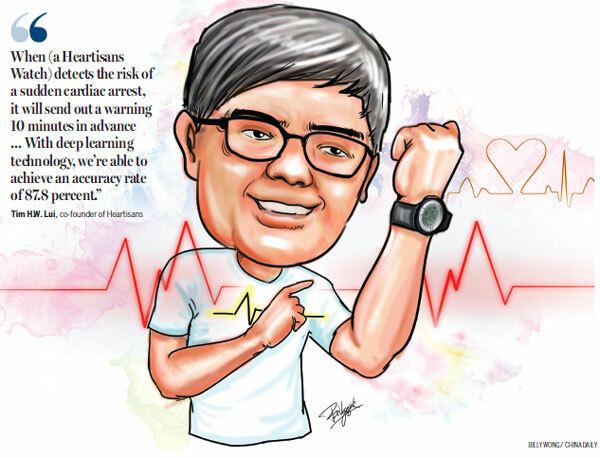 Heartisans Watch estimates a person's blood pressure by measuring the speed of a pulse flowing from the heart to the wrist, explains Lui, co-founder of Hong Kong startup Heartisans. PPG (photoplethysmography) and ECG (electrocardiography) sensors are installed in the device to minimize signal interference caused by the body's natural movement, he says. "The smart watch records and analyzes a user's health data with our algorithm consistently. When it detects the risk of a sudden cardiac arrest, it will send out a warning 10 minutes in advance, allowing them time to seek emergency medical treatment," Lui tells China Daily. "With deep learning technology, we're able to achieve an accuracy rate of 87.8 percent." "In future, we will introduce a remote diagnosis function into the app so that a user can seek advice from doctors at home," he says. According to the Department of Health's Centre for Health Protection, heart diseases have been the third-commonest cause of death in Hong Kong, accounting for 13.2 percent of all deaths in 2015. The city recorded 6,190 registered deaths from heart diseases that year, with coronary heart disease being the main cause of death, taking up 66.6 percent of fatalities from heart diseases. Some of Lui's family members have a history of heart disease. The fervent hope of ensuring the safety of his loved ones inspired Lui to launch his project. Heartisans had secured HK$3.5-million funding from the Hong Kong government's Innovation and Technology Fund. It was also included in the three-year Incu-Tech Program run by Hong Kong Science and Technology Park, in which various support will be given to help the company grow bigger and stronger. The smart watch is currently going through clinical trial. Lui says Heartisans has teamed up with Queen Mary Hospital to put it into practical use. "It's believed that five to six percent of patients with heart diseases could face a relapse within 40 days after recovering. Several patients in the hospital have been selected to use our product to test its effects," says the Hong Kong entrepreneur. He says 6,000 units of Heartisans Watch are expected to be produced this year and will be available in Hong Kong with a price tag of $200 each. "The local market is relatively small compared to the mainland's. Therefore, we're seeking to cooperate with mainland partners to promote our product there," Lui says, adding that the company plans to set up an office in Shenzhen's Qianhai economic zone to facilitate its development on the mainland. According to this year's first quarterly report by iiMedia Research - a global mobile internet firm focusing on third-party data mining and analysis - wearable medical health devices have been gaining increased recognition from the public, with 60.5 percent of respondents saying they would like to use them when necessary. However, usage of the devices has been limited mainly to data monitoring. Industry analysts from the organization said technological advancement and further enhancement of public recognition are needed to promote wider application. The report said the number of people using wearable medical health devices could see explosive growth if the products are well designed to meet public demand and are easy to use.